Roundwood Variety Group will hold a Super Duper Fun Disco in Roundwood Parish Centre on Friday 28th November from 7pm – 9pm. All primary school children are invited to come along for a great night of fun. Admission €5 which includes a drink and a bar. Tuck shop on the night. Lots of spot prizes! Roundwood Variety Group are delighted to announce that they will be selling vouchers for their upcoming musical The Ugly Duckling which will take place from Thursday 29th January to Sunday 1st February. Vouchers can be bought for Christmas presents and then exchanged for tickets when they go on sale in early January. To purchase your voucher please ring 086 8287858. There will be a cabaret in The Royal Hotel in Glendalough will now be on Saturday 29th November instead of Saturday 15th November in aid of the Senior Citizens Christmas party. Your support will be welcome. The Tom Mulligan Branch of the Labour Party Kilmacanogue.are holding their annual Christmas social evening in Plucks (Formally the Glencormac Inn) Kilmacanogue on Saturday 6th December 2014 from 9pm. Gary Taaffe will provide the music and entertainment. As usual finger food will be provided. This is a very special evening for the branch as they are celebrating the 60th anniversary since the Labour Party Branch was formed. All are welcome to come along and enjoy the evening. The Roundwood Calendar 2015 will be officially launched on Saturday the 29th of November 2014 in Roundwood Parish Hall at 7:30pm. The cost of the calendar at the official launch will be €6 and will sell for €7 thereafter in local shops. Many thanks to everyone who submitted photographs for inclusion. Unfortunately only a small selection of the hundreds submitted can fit into one calendar! The calendar will make a fantastic Christmas present for friends and family abroad. Light refreshments will be served and all the community are very welcome on the night. Our Parish Christmas Sale of Work will take place on Sunday the 7th Dec, 12-4pm in the GAA Complex so get your Christmas Jumper & Santa Hat ready it will be a great day out with something for everyone including Wheel of Fortune, Bottle Stall, Flowers Swags & Table Centres, Teas, Big & Small Raffles, Home Baking, 6th Class Stall, Bric a Brac, Auction, Books, Roulette, Face & Nail Painting, & Totoo’s, Christmas Carols & much much more you will also be able to purchase the 2015 Roundwood Calendar and order or purchase your Club Gear. Giggles will be in attendance & Santa will be there to meet all the children at 1pm. Donations for all the stalls and attractions are very gratefully received on the day or can be left in with Maureen in the Parish Centre during 9.30am-12noon daily for further queries contact Caroline Sillery at 086 171 4973. There will be a Progressive 45 Card Game in the Parish Centre at 7.30pm on Sunday the 7th December In aid of the Parish Sale of Work Excellent prize money refreshments served everyone welcome. The Christmas tree lights will be turned on at Roundwood Old School on Saturday 6th of December after mass at 7.30pm. Get your Santa hats on, join in the Christmas carol singing to kick off the festive season. Light refreshments will be served afterwards in the Old School. Congratulations to all involved in Roundwood Tidy Towns and particularly our local Tús participants, Justin Cahill and Fran Walsh, for their work in helping the group win two prizes recently in the Wicklow Co Co Tidy Towns Awards. The group won first prize for natural heritage and third prize in the best main street competition. Thanks to everyone who helped out during the year, keep up the good work. Monday 17th November saw Ger Lenihan and Paddy O Brien play their cards right for North/South Molly Byrne and Rachel Judd were 2nd , Margaret Byrne and Brid Clancy were 3rd and Pauric Gleeson and Maura Gaskin were 4th. East/West victors were Bridie Nolan and Phil Power, 2nd Monica Brady and Catherine Halligan, 3rd Clare Sally and Margaret Byrne and 4th Mary Pierce and Pamela Byrne. In first place by 2 points for North/South on Friday 21st November were Seamus Kennedy and Gaye MvGettigan, 2nd Noeleen Redmond and Margaret Bolger and 3rd Monica Brady and June Digby. East/West winners were Maria Magee and Jim McNamara, 2nd Ger Lenihan and Paddy O Brien and 3rd Liz Belton and Teresa Leahy. Leinster Unevens XC Championships Adamstown 9th November . Congrats to all our juveniles who competed so well in this cross country championship competition. Winners on the day were Denis Leacy U9 5th, Conor Fee U11 8th and Eve Leacy U13 9th. Well done also to U11s Chantelle Pelz-Olufade 72nd, Ella Lawless 93rd, Aimee Byrne 130th, Luke McKenna 28th, Daniel Byrne 106th. U13 Izzy Ryle 111, Darragh Fee 18th, Jordan Brady 61st, Roan Hayes 80th, Donal Byrne 97th. U15 Sean Byrne 74th. Competing in the U9 Non-Championship races along with Denis we also had Tom McKenna and Chantelle Heatly, who slipped & fell early on but still got up and finished high in the rankings so congrats to both these very young athletes! The annual club AGM will take place on Thursday 27th November 2014 at Aras an Tochar at 8pm. Please try to come along to this important meeting as we will be outlining some exciting plans for our future. Set dancing classes commenced on the 5th November at 8pm in The Mill Room, Kilcoole . Classes for all levels. A trip to the shrines of France will take place from 11th to 18th April, 2015 for seven nights, visiting Lourdes, Rocamadour, Nevers, Paris and Lisieux. The total cost is €799 per person sharing. Details are in the church porch. Deposit of €200 should be paid as soon as possible and the balance of the oney before 1st February, 2015. For more details please contact Susan O’Neill a t 0404 45276 after 8pm. 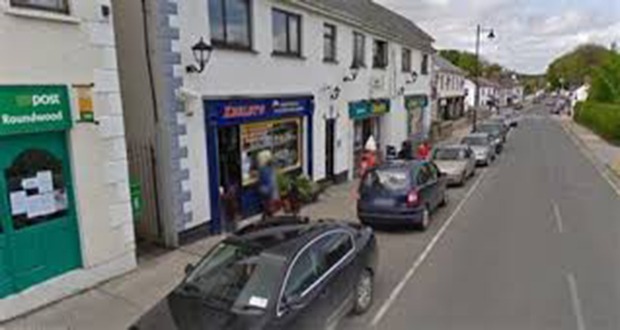 At the Roundwood & District Community Council meeting last night the Gardaí outlined a number of incidents and serious complaints received due to parking on the footpath opposite the shops on the Main Street. The situation is now so serious that someone will be critically injured or killed. From now on illegal parking will not be tolerated and our local Gardaí will be enforcing this rigidly. Another issue raised is speeding through the village. Wicklow Co Council staff working with our local Councillors and the Community Council will be making a submission to the National Transport Authority seeking funding for further traffic calming measures in the village. The Gardaí are well aware of the issue and are taking the necessary action to discourage speeding by deploying the GATSO van and regular speed checks in the coming months. Please heed these warning. This action is being taken for your safety and that of our children. The next Whist will be tonight Wednesday 26th November in the Parish Centre.